Leave the car in the parking garage: You can get around Tampa Bay on two wheels. 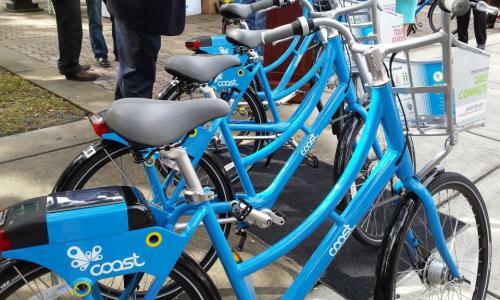 After a members-only kick-off Nov. 17, Coast Bike Share will open to non-members on Dec. 7. All you need is a credit card to get moving on one of their 300 sky-blue bikes. Stations are scattered across downtown, Ybor City and other popular neighborhoods like Historic Hyde Park. The bikes are sturdy and built for city riding. They have a front basket so you can keep both hands on the handlebars. They have a driveshaft instead of a chain, so your pants legs don&apos;t get greasy. Seats adjust up and down so you get the best fit. GPS keeps track of you and the bike as you move from spot and spot and station to station. Pick up a helmet at City Bike Tampa or bring your own. Tampa Bay&apos;s growing network of on-street bike lanes and off-street bike paths will help you get around safely. If you&apos;re just taking one out for a spin, try a turn on the Tampa Riverwalk or Bayshore Boulevard for some waterfront sight-seeing. When you&apos;re done with your ride, return the bike to any of the 26 stations located around the city and you&apos;re done. If you can&apos;t wait for Dec. 7, you can buy a membership in Coast Bike Share and get started riding today.